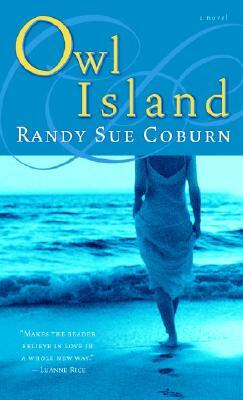 In this accomplished and dazzlingly written new novel, Randy Sue Coburn brings to life with tremendous heart, humor, and wisdom the Pacific Northwest enclave of Owl Island and its many unforgettable inhabitants. Among the aromatic cedars and lush firs, close to where Chinook salmon maneuver the choppy waters, Phoebe Allen has lived quietly and self-sufficiently for twenty years, raising her daughter, Laurienne, and running a small fishing-net business. But Phoebe’s past suddenly washes up on the shores of Owl Island: Renowned independent film director Whitney Traynor buys a house nearby on Spit in the Wind Road, forcing Phoebe to pry open the lid she’s kept clamped on her secrets and scars, plunging her ordered existence into chaos. Whit was charismatic enough to “charm the ice off a dog dish” when Phoebe first fell in love with him as a voice on the radio, and he has not lost his touch–or his propensity to stir things up without even trying. Phoebe, Laurienne, and everyone else living on Owl Island are affected by his arrival. And Phoebe’s newfound intimacy with Ivan, a longtime friend and neighbor, far from offering escape, only further complicates matters. Memories of Whit transport Phoebe to a time long ago–one of innocence and awakening, passion and purpose, euphoria and regret–before their intense relationship came to an acrimonious end. All these years, Phoebe has concealed truths from her daughter and may now be forced to divulge them. As the past rushes toward the present like an inevitable tide, Phoebe must also confront the early loss of her mother, whose own mysteries are at last beginning to surface. A deeply affecting portrait of mothers and lovers, daughters and forgiveness, Owl Island reveals the damaging power of secrets, the importance of community, and the liberating lessons of love. Randy Sue Coburn is a former newspaper reporter whose articles and essays have been published in numerous national magazines. She is the author of Remembering Jody, a first novel hailed by Booklist as “a wry and compassionate emotional roller coaster from a master storyteller,” and her screenplays include Mrs. Parker and the Vicious Circle, the critically acclaimed Cannes Film Festival selection that received five Independent Spirit Award nominations, including Best Screenplay. She lives in Seattle and teaches writing at the University of Washington.